Boxer puppies are some of the most popular pups around. These lovable creatures are incredibly affectionate and have a unique appearance that will make any dog lover melt. Young puppies carry the breed's signature physical features from the start. With their innocent and inquisitive faces just waiting for attention, it's no wonder why these puppies always rank amongst the most beloved dogs in the world. you'll need to provide them with the best diet possible. Boxers already have unique dietary needs to take care of. During the puppy years, those nutritional requirements are more important than ever. Here's a quick overview ​​​​of the recommended puppy formula's. With an adult weight that can get up to 70 pounds, these dogs experience rapid growth during their puppy years. This stage in their life is an important one. They need just the right amount of food to stay healthy as they grow. It's a fine line between providing too much food and too little. A significant leaning to one direction can result in significant joint issues in the future. While it may look like puppies don't eat a lot of food, it's much higher than that of an adult Boxer in terms of weight and calorie count. It's important to monitor your pup's condition as they age. 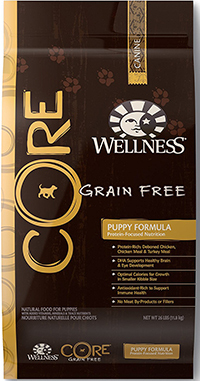 In the first year alone, your puppy's dietary requirements will change dramatically. It's a good idea to weigh your puppy every couple of days and adjust their meals accordingly. The figures below are estimates based on the average Boxer. No two dogs are alike. Your dog's dietary needs may deviate slightly from the norm based on their gender, activity levels, and more. You should always adjust the calorie levels based on your dog's unique build and lifestyle. Boxer pups will need, on average, about 55 calories for each pound of body weight every single day. This is significantly more than the 25-30 calories required by adults. 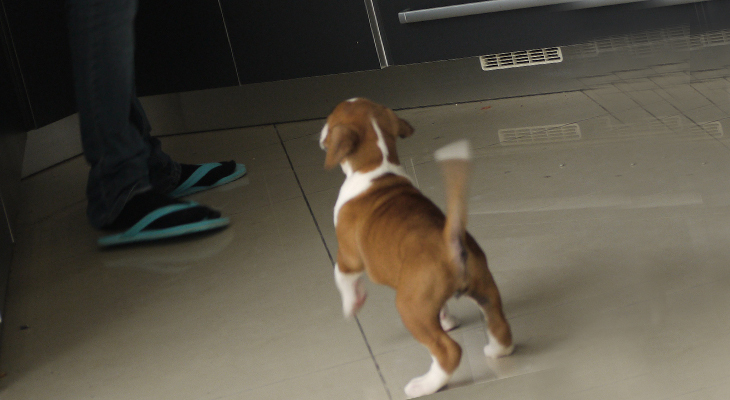 Because Boxers grow up so fast, you'll need to calculate their dietary requirements quite frequently. The amount may change on your puppy's lifestyle. Active pups that spend all of their time playing, running, and going for walks may need upwards of 60 calories per pound or more. On the contrary, mellow canines can fare well with as little as 50. Most Boxer puppies weigh about a pound when they're born. During the first few weeks of age, they'll get all of their nutrients from their mother's milk. When they're finally weaned off, you'll be surprised by how much they've grown. At three months of age, your puppy will weigh anywhere between 21 and 26 pounds. At this point, they'll need approximately 1,300 calories of food each day. After about six months of rapid growth, your puppy's development will start to slow down a bit. This is perfectly normal. They're still developing internally. However, their physical size growth will be more gradual. Depending on their lifestyle and gender, puppies should be between 39 and 49 pounds. This equates to just over 2,400 calories a day. As you're celebrating your furry friend's birthday, take some weight measurements and see how they're doing. They should be between 53 pounds and 67 pounds. They're almost to full adulthood! The rest of the growth cycle will be minimal. At this point, they should be getting around 3,300 calories or more. High-quality dog food is the fuel your Boxer pup needs to thrive and grow. Here are a few formulas that provide a healthy and balanced diet for your growing dog. 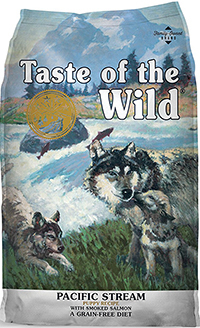 This Taste of the Wild dog food is great for Boxer puppies because of the superb ingredients used. This particular formula uses salmon and ocean fish meal as the main source of protein. In total, the recipe is made up of about 32% protein. This is essential for developing strong muscles at an early age. It's also filled with vitamins and minerals thanks to the wide assortment of plant-based ingredients. Additional benefits of the kibble are its use of probiotics for good digestive health, antioxidants to improve the immune system, and a small size that's perfect for small jaws. 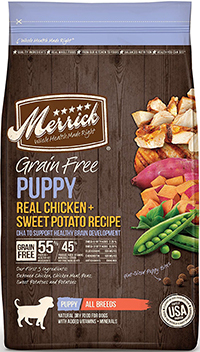 From Merrick is this formula that's specifically designed for puppies. It can meet the unique dietary requirements of large growing dogs. There are no unnecessary ingredients included. This helps to improve digestibility and ensure that your puppy is getting a balanced diet they need. The main ingredient is deboned chicken. This is accompanied by complex carbohydrates like sweet potatoes, antioxidant-rich fruits like blueberries, and high-fiber vegetables like kale. It also has a healthy dose of DHA to support brain health. 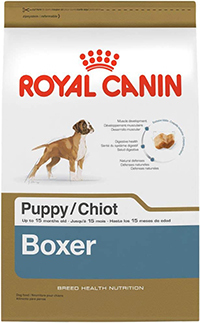 Royal Canin has created a food that's catered to growing Boxer puppies. It's made up of an impressive 28% protein. The protein works with the supplementary L-carnitine to ensure proper muscle and bone development. A healthy blend of antioxidants supports your puppy's immune system as they grow as well. One unique thing about this kibble is that it's shaped to make eating much easier for a Boxer. Your pup will be able to pick pieces up with their unique face structure. nstead, you'll find wholesome ingredients like deboned chicken, peas, flaxseed, and much more. In total, protein makes up about 36% of the food. It includes DHA for brain health as well as an array of antioxidants to strengthen the immune system. To keep stomach issues at bay, probiotics, prebiotics, and plenty of fiber are added to the mix. 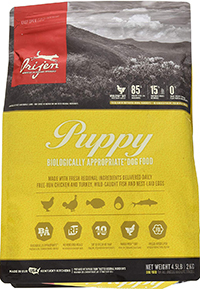 The Orijen Puppy food utilizes unique ingredients throughout. It's made to mimic the diet of a wild wolf. Protein makes up about 38% of the recipe. The specific sources of that protein include deboned chicken, deboned turkey, yellowtail flounder, eggs, mackerel, and so much more. It also contains nutrient-rich animal organs as well. There are no grains included. However, there is a wide variety of vegetables added. Kale, spinach, apples, carrots, butternut squash, and so much more add the nutrients your dog needs to grow. How Many Times a Day Do You Feed a Boxer Puppy? Boxer puppies need to eat frequently throughout the day. Their caloric intake should be separated into multiple meals. Not only is it healthier, but it also makes things easier to get down. Puppies need to absorb the food properly before they can eat more. Some owners choose to free-feed during the puppy years. While this may be adequate for some dogs, it's better to create a structured feeding schedule for Boxers. These puppies are prone to overeating if you let them. You can avoid excessive weight gain and establish a schedule early on by sticking to the following guidelines. During the first three months, you should be splitting up their calories into four separate meals. Between three to six months of age, you can decrease the frequency of meals to three times a day. You can determine the right time to make the change by taking a look at your pup's body. Most dogs will start to lose baby fat around this time. This indicates that it's a good time to move forward with the feeding schedule. At about a year old, you can start to provide only two meals a day. Two meals are recommended throughout their life, so it's a good time to start establishing a routine that you can stick to. Depending on your particular dog's body and development, you may have to wait it out a couple of extra months. Keep an eye out on your dog's activity and energy levels. If they're having a hard time adjusting, you may need to wait until they're 13 or 14 months old. Feeding your puppy based on their weight is a great start but it's not the only thing you should be considering. The rule of providing 55 calories per pound of body weight every day is simply a guideline to give you a good idea of the general amount you should be serving. Body condition should also be used. Body condition refers to how your dog is built. A scoring system is used by veterinarians to determine the level of body fat a dog has. A low score of 1 indicates that your puppy is emaciated while a score of 9 means that they're obese. You can use the same principles as the body conditioning test to determine whether or not you need to adjust your pup's daily intake. Take a look at your puppy from above. You should be able to see a clearly defined waist. This means that your pooch is at a healthy weight and they're getting just the right amount of food. If you see ribs, add some more food to their bowl. If their body is noticeably round with no defined waistline, cut back a little. 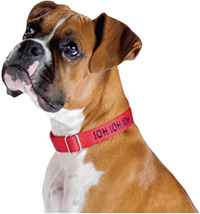 Boxers can usually make the switch to adult food around the 1-year mark. The bulk of their development has already completed, so they won't need the specific nutrients and high calorie count as younger puppies. They'll continue to grow in size, but the change will be slow and minimal. f you're unsure, stick with the puppy food until they get to a suitable weight and size. When you're transitioning to adult food, you need to do it slowly and carefully. The digestive system will need a little bit of time to adjust to the new food. Start by adding a little bit of adult food to the puppy formula. Over the course of a week, gradually increase the adult food amount and decrease the puppy food amount. During the change, monitor your dog's activity levels and poop. If they start to experience stomach issues, stay at the current food ratio you're at and slow down the transition. When you feed your puppy, you can choose to go with canned wet food or dry kibble. Most owners typically use a combination of both. They both offer their unique advantages and disadvantages. Dry food is easier to come by and is more nutritionally dense than wet food. Your puppy would have to consume more wet food to match the calories offered by a smaller volume of kibble. However, wet food provides the distinct benefit of being easier to eat. Young puppies don't have the strong jaws and teeth of their adult counterparts. As a result, it's a good idea to supply some wet food during the first few weeks of food. 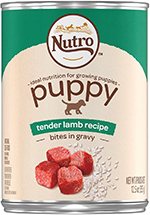 If you start with canned food, your puppy can be weaned off their mother's milk at about 3 weeks of age. Normally, you'd have to wait for about 6 weeks to switch to kibble. 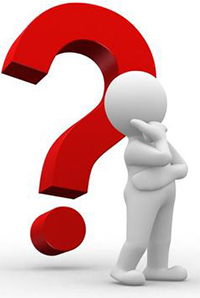 Even if you do decide to start with dry food, it should be moistened with water. Adding a bit of water and smashing the food up with a fork creates a soft paste. The kibble still has all of its nutrition. However, it's easier to consume by puppies. It's a good idea to provide predominantly dry food at about 3 months old if you plan on supplying your dog with dry food as an adult. The full-flavored food from Nutro uses limited ingredients. There are no byproducts, unhealthy fillers, or potentially dangerous preservatives. Despite having fewer ingredients, the wet food can provide your pup with a balanced diet. It's specifically formulated for large dog breed puppies like the Boxer. Lamb is used as the main source of protein. Lamb liver is also used for a boost of nutrients. To help keep your dog's skin and hair supple, fish oil is also included. 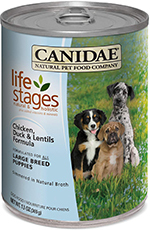 Made for large breed puppies, the wet food from Canidae is great for your Boxer. Chicken and duck are used as the main protein sources. They're is accompanied by lentils and peas. These nutritional carbohydrates burn slowly to ensure that your puppy has high energy and metabolism throughout the day. In addition to the great nutritional content, the canned food was made to be delicious. It's cooked in broth so that all the flavors blend together and create something that your dog will want to eat up. Taking the time to plan out your Boxers' meals and to find a high-quality puppy formula can have a noticeable effect on how your dog is as an adult. Providing a balanced and appropriate diet will set the foundation for a life of success and good health. Are Bully Sticks Safe for Puppies? Why is my Puppy Always Hungry? Crush the Cravings .. Copyright 2019 by Avid Pup.